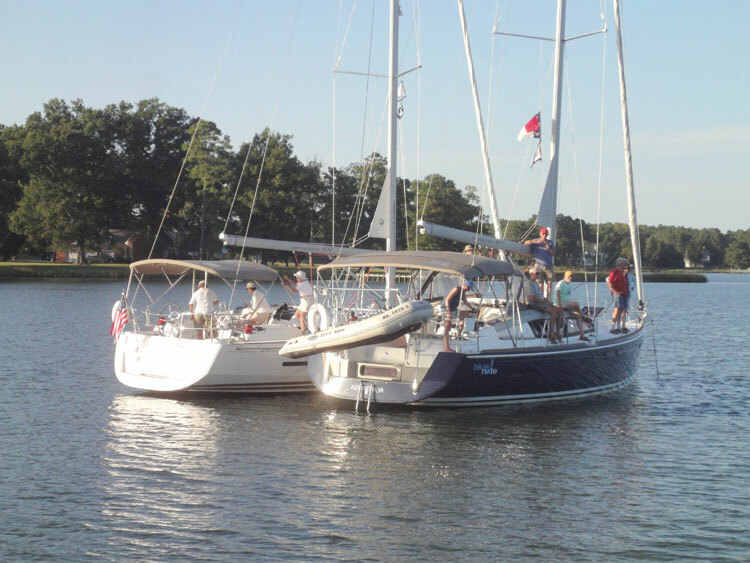 A group from the Philadelphia Sailing Club (PSC) set sail in mid-September from Norton Yacht Charters in Deltaville, VA. PSC members have the opportunity to participate several charter trips each season. On this trip, we had hurricane Jose as an unintentional part of our sailing plans. This is my third PSC trip from this home base. Once again, I was awed by the quietude and vastness of this part of our beloved Chesapeake Bay, and of the diversity of possible destinations. Except for our last night’s anchorage, every other night was new to me. One thing, happily, remained constant from my past two trips, namely the wind. We had awesome sailing conditions just about every day. Due to the aforementioned Jose, we spent two nights at a marina in downtown Norfolk. In the cruise to the Norfolk marina, I thought Kent Main was joking when he said there were three sharp shooters aimed at our boat as we passed the Navy destroyers— until they disappeared after we were past them! Norfolk has a lot to offer, including places to hunker down during rain showers and places for transients to take a shower. On the way to Cape Charles our boat’s crew opted to visit the sunken concrete boats off Kiptopeke State Park. The concrete ships were used as cargo ships during WW II. Yes, concrete does float, and steel was in short supply during WW II. After the war, the concrete ships were obsolete and were used in many places, such as they are here, to protect the waterfront. Thanks to our ECMs, Kent Main, Al Ponessa, and Bobby DuBois for all their work to make this a great trip! 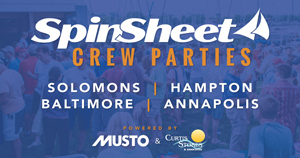 If you think you might enjoy sailing, are a boat-less sailor, or wish to meet other sailors, PSC might be for you. Sailors of all levels are welcome. Learn more here.